In first game back after tearing his ACL in summer 2015, Siyani Chambers ’16 (’17) scored 12 points and dished out a team-leading four assists. Last Saturday in Shanghai, the Harvard men’s basketball team played a rematch that was a decade in the making. And although the Crimson lost the game, the event offered a glimpse of how far the team has come. Back in 2007, Stemberg men’s basketball coach Tommy Amaker began his Harvard tenure with an away-game loss to Stanford that, at 111-56, was one of the most lopsided defeats in program history. This year, the Crimson again opened their season against Stanford, this time as part of the second annual PAC-12 China game. This contest was far closer: trailing 30-28 at halftime, the Crimson fell to the Cardinal 80-70. Held in the massive, clamshell-shaped Mercedes-Benz Arena, the event is organized by the PAC-12 conference in partnership with the Chinese-based e-commerce company Alibaba Group and the Federation of University Sports of China, an organization housed in the Chinese Ministry of Education. The invitation itself spoke to the rising stature of Harvard’s basketball program (since Amaker’s arrival, Harvard has won five Ivy League championships and reached the NCAA tournament four times). That’s because the PAC-12 is a more more competitive conference than the Ivy League, whose teams—located in Arizona, California, Colorado, Oregon, Utah, and Washington—often earn high national rankings and compete in the NCAA tournament year after year. A victory over Stanford, with which Harvard competes for recruits, would be the kind of win that could, for example, help push a team like the Crimson into the tournament come March. He was hinting at the changes on this year’s roster, which have lent a sense of optimism and renewal to the new season. The most important addition: Siyani Chambers ’16 (’17), a three-time all-conference point guard who returns after missing last season with a torn ACL. The Crimson also welcomed to campus seven freshmen whom ESPN rated as the tenth-best recruiting class in the country. (Four of the players—Chris Lewis, Seth Towns, Bryce Aiken, and Robert Baker—ranked among the top 100 high-school seniors in the country last year.) The team also added two new staff members: director of basketball operations Casey Brinn and assistant coach Michael Sotsky. Playing in his first college basketball game in nearly 20 months, Chambers made clear why Amaker has called him the team’s “undisputed leader.” With 12 points and a team-high four assists, he also made subtle but significant plays that helped keep the game competitive. When the Crimson were holding the ball for a final shot just before halftime, Chambers drove into the lane, drew a foul, and sank two free throws to cut the deficit to two. In the second half, when Stanford seemed to be pulling away, he stemmed the momentum with a steal and several baskets. That intelligent, effective play-making will not always show up in a post-game highlight reel, but over the course of a season, the impact is sizable. The new recruiting class also made its presence felt. Led by Aiken (who had a team-high 21 points) and Henry Welsh (11 points and six rebounds), freshmen accounted for 51 of the Crimson’s 70 points. Welsh, a center, scored several of his baskets on deft post moves; Lewis—another post player—swatted back-to-back shot attempts on one Stanford possession; and Towns scored and drew a foul on a thunderous baseline dunk. But the defense was another story: it will take time to gel and mature. Several times, Stanford scored easy baskets when Harvard’s freshmen did not sprint back on defense. The team also struggled to defend without fouling, and the freshmen, particularly Towns, who fouled out, were key culprits. The trip to Shanghai wasn’t just about the Stanford game. The team spent a week there, blending basketball and cultural immersion. The Crimson played an exhibition game against a local university, Shanghai Jiao Tong, and won it 84-64. They visited temples, museums, and Alibaba’s company headquarters. They spent an afternoon at Shanghai Disney. And they took midterms: several Crimson players sat for an exam at the same time as their classmates back in Cambridge (overseen by Plummer professor of Christian morals Jonathan Walton, Pusey minister in the Memorial Church, one of several faculty traveling with the team). Now, as the team transitions back to Cambridge, the work of the season begins in earnest. 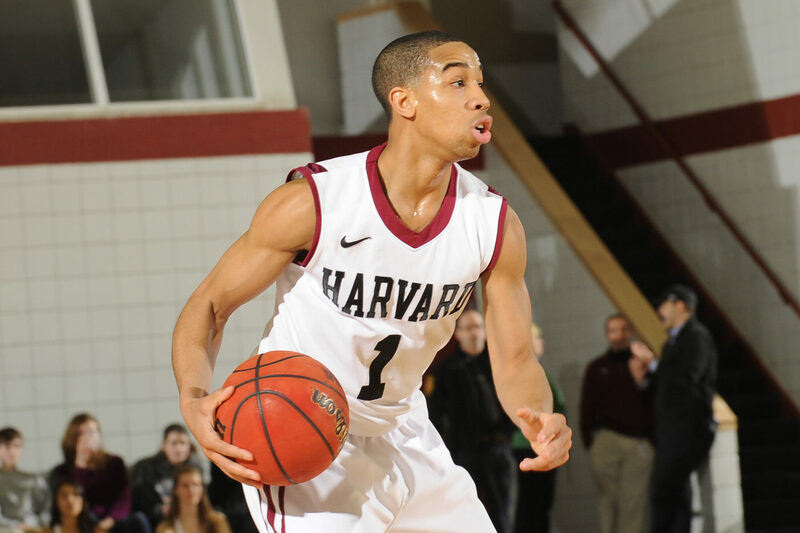 Harvard returns to the court on Thursday against Fisher College, a Division Two school in Boston. •On the night before the game, the Harvard Alumni Association hosted a gathering at the Harvard Club of Shanghai for local alumni and for those who had traveled to China for the game. Athletic director Bob Scalise had been scheduled to speak, but the recent controversies concerning sexist behavior by members of the men’s soccer and cross-country teams kept him in Cambridge. Walton spoke in his place. Mark Elliott, Schwartz professor of Chinese and Inner Asian history and vice provost for international affairs, also spoke, and emphasized the seriousness of the administration’s response to the soccer and cross-country teams (the men’s soccer season was canceled). •Late in the second half, Chambers drove to the basket, fell, and began clutching his left knee in pain. After the game, Amaker said that the team had no immediate word on whether Chambers had reinjured his knee but indicated that it was a good sign that he was able to walk off the floor under his own power. •The visit to Shanghai was the second trip to China by a Harvard men’s basketball team. The first came in 1980, when the Crimson played a series of exhibition games against local teams at the outset of China’s opening to the world after the chaos of the Cultural Revolution. •The women’s basketball team also began its season over the weekend, falling to Minnesota 103-87. The Crimson sank 16 three-pointers, tied for a program record. Madeline Raster ’19 led the way with 18 points on the strength of six threes, and Jeannie Boehm ’20 added 15 points in her college debut.